Finding bream - Lake Houston Fishing! This is the last weekend for spring break and my 7 yr old suprised me and asked if I could take her fishing before she goes home. I took tomorrow off work and taking both my girls 6 and 7 fishing. Plan on trying to catch some pearch or bream and was wondering if bjs would be a good spot to catch some off the bank? I've launched out of there plenty of times but never tried fishing from there. Dutch and Sticko also live near you and can tell you where to go closer to home. I read that they catch bream at Nasa lake but I don't know where that is. I would send them a PM and ask for more info. Hope you have a good time with the kids!!!! I went out last night and put the boat in at lake Houston marina. 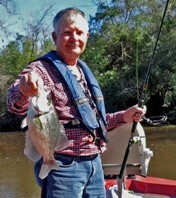 I caught several nice bream in the cast net and even caught a nice 14in crappie (which I released). There were a lot of people still fishing @9pm tells me if you just fished the docks right up against the bulk head at LH marina with a small bream hook under a bobber with night crawlers you should have some nice action. If you had some live minnows you could catch some crappie and catfish. Good luck! Liqued i sent you a private message about it check pm new messages at top.